This golden Thai Pineapple Fried Rice is an excellent party dish which will attract everyone with its mild sweet and spicy taste. 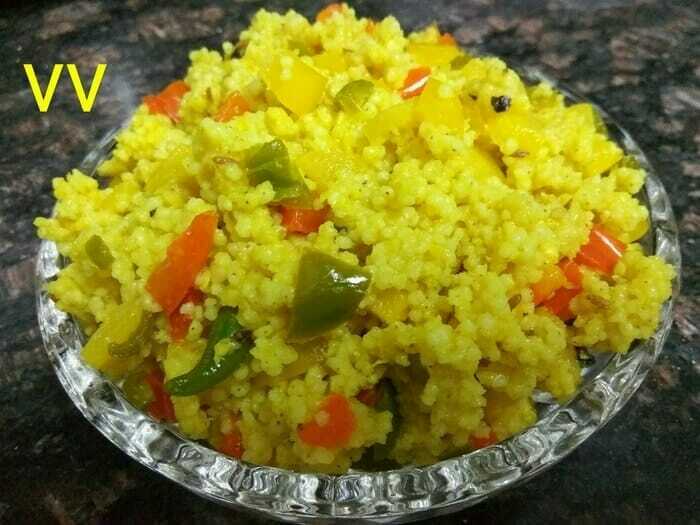 The bright yellow coloured millet grains jewelled with precious stone like coloured bell peppers, takes away our heart instantly! Spread the Millet Rice in a vessel using a fork by adding a tsp of oil. Mix coriander powder and turmeric powder to the soya sauce. In a pan, add oil. When hot temper jeera. Add green chillies, ginger and shallots. Saute till it becomes transparent. Add other veggies. Saute for a few minutes till they become little soft. Do not overcook the veggies. Let them remain crunchy. Add pineapple pieces, salt, soya sauce and saute for 2 minutes. Remove from heat. Add the cooled millet rice and give a good mix. Add crushed pepper and lemon juice.